1. add duration and distractions to heeling – try it in different environments, reward a lot there, but apart from that, start adding more duration: reward every couple of steps with a small reward first, then do a really long distance and big jackpot for it – then a couple of steps for a small reward and a really long distance for a great reward again – vary it a lot for them to be able to see the pattern that the longer there is no reward, the better! 4. “sit up” to “stand up” and back and “down” to “sit up” and back – great for strength in the back, especially important for those who will be doing agility. Down to a sit up and back should go easy, use a hand signal together with your verbal cues. 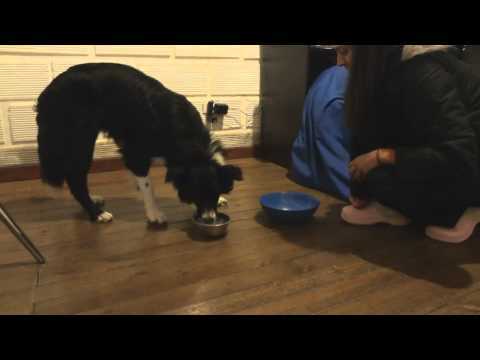 First, reward even if the dog goes into a sit for a second, but then try to get rid of it and go for direct transitions from one position to another. Sit up to a stand up is easy too, you can use a lure for that one. Going back to sit up (without falling in sit first) is hard, so offer your hand as a support so that the dog can lean on it and then click for any knee bending until actually going into sit up. This is conditioning exercise, so you can help some more with lures if necessary. As always, don’t do so many repetitions that the dog would be sore after, you need to build muscle and balance gradually. 5. another great warming up exercise to stretch the dog before the run: spins to left&right and figure 8 forward. 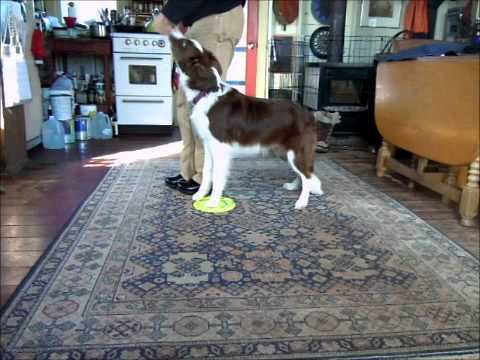 I teach it with a nose touch, putting a hand for a nose touch on the right spot (somewhere at the dog’s hip) to get a spin, then getting more&more spins in the same direction in a row, fading the hand and putting it on verbal cue left &right – very useful to have those directionals also on a course! I also do figure 8 forward with a nose touch, putting a hand so that the dog comes between the legs, rewarding at the side and then again the other direction. Fade the hand then into a hand signal and then completely, using just a verbal cue. I simply use cik&cap as the dog is wrapping an object again - my leg. And yes, sure, that nose targeting is almost as luring and if you wanted, you can also shape it instead. I will sometimes lure as sometimes, it is the easiest way to the goal. I never lure at the very beginning stages as I want a puppy to understand the concept of shaping first because many things simply can’t be taught by luring, so at one point, you need a dog who will offer behaviors. If you always help with easy tricks and then count on simply going to shaping when needed, you’ll get in trouble. But I don’t have a problem with going the other way around: first only shape, but later on do some luring or targeting when teaching something as easy as figure 8, spins or sit up to stand up. You again have 2 weeks to work on those exercises and post videos to comment and suggestions for improvements. Then, I will open a new, "graduation page" and this will be your very last assignment: making a video of everything you learned in this class – without training sessions as such, but finished version of tricks, some breakthrough moments, some playing, city walking and everything else you did with your dog for this class (using what you already taped or taping some more). Those videos will be your graduation work, you will get a “LoLaBuLand puppy class graduate” certificate and as a gift, a download link to a training video of your choice (see the training videos website to choose one). Auditors are more than welcome to post graduation videos too! And then that's it for this class, but I hope to see many of you also in Foundations, starting 27th February! If you want to continue with tricks too, you're also welcome to join Advanced Tricks. Advanced Tricks have open registration, meaning that you can register and post whenever you want, no time limitations. It would be cool if a group from October Puppy Class joins too! And the third option you have is to join Running Contacts class that started today. Next RC class will probably only start in September - or MAYBE May. Here’s Star’s progress on “side legs”. We started with a slanted board to the wall, then faded that out. 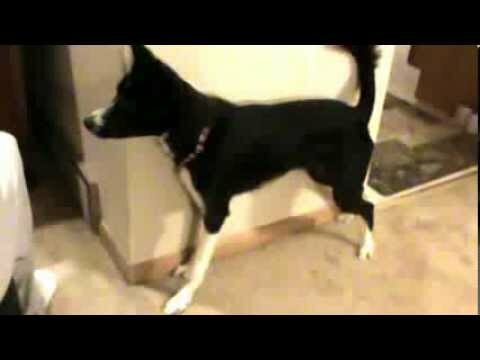 She seems to get the idea with the back leg, but is mainly just lifting the front one, not putting it on the wall. Is there anything we should be doing differently? Oh, she doesn’t need to put the leg on the wall, we’ll be fading a wall soon anyway. Click for lifting both feet up and then slowly add duration -- and we are actually preferring NOT leaning on the wall and trying to click before she touches it. The next step is doing it against the chair and then without an object and they need to learn now already it’s about lifting both feet up, NOT putting them ON something anymore. Hope that makes sense? Cik&Cap alias Tic&Tac : Why do I get very tight when Garlic is trying to catch a noisy ferret and I can’t get other waY ? How to get it with a cue ? Handstand : her back seems to be a little twisted like a C ? Hug : the little bottle is slides ! Cool, some really nice hugs already! Slowly add duration. If you think a better grip would help, you can tape a piece of an old T-shirt around it. Nice cik&cap too, try to keep a ferret as a reward, but don’t show her the way with a toy anymore, but with an empty hand + a verbal cue, to get her less dependant on a toy. Her position for a handstand is good, keep practising to the wall for some more weeks to build strength and balance and then try to fade it by using thinner&thinner objects. Great spins too! Really cool, Pascal, congratulations, Garlic is very skilled -- seems so easy for her to get into handstand. Just my experience: For the cik&cap, I found it a lot easier when I am standing as I can add some more action to it. I tried table leg first, too, but I switched to a cone and with my hand giving directions, she circles faster. Maybe it will help Garlic, too? Here is where we are with heeling. I feel like we haven’t progressed very far since our last video of fading the pivot. We seem to be stuck here 🙁 And I wonder if I’m doing something wrong. Zephyr gets really snappy when taking cookies when we work on heeling. It’s not a problem when we’re doing other tricks so it makes it a little unpleasant (probably for both of us) to work on this trick. 🙂 I would love some advice on what to do. Thanks! I can’t believe this class is almost over! 🙁 We’ve had so much fun! 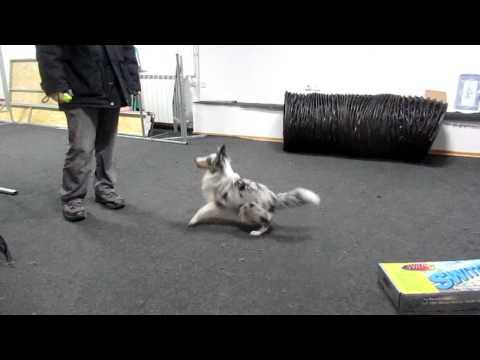 Puppy Class Zephyr -- Fading pivot, 2 legs, etc. Vini doesn’t master the sit up yet so I’ve skipped the to-do’s that includes sit up. For some reasons Vini believes (yeah, probably I’ve rewarded her for it ;-)) that when glued to my leg then it’s not only one leg but both legs when I walk forward -- meaning she walks sidewards behind me. I tried walking a bit faster forwards but then she doesn’t follow me immediately. How should I change this behaviour? As there are many of the tricks Vini doesn’t master fully I will likely sign up for this puppy class once again. Very sorry to hear about your dad, Carina. My sympathy on the loss of your dad Carina. Sorry to hear that, Carina -- hope things will get back to a little more normal soon. Sorry to hear about your dad, Carina. Wow, what a cute and firm hug!!! Really cool figure 8 backwards too! Did the heeling problem started when you started with figure 8? It can get them somewhat confused and make them go behind your back more as you would want to… To clean that up, I would start some sessions on a flat target and then slowly circle away, as you can see in Kathy’s video. Return to the target whenever she gets confused. You can even put more in a row then and do forward walking from one target to another, first having them spread just one step apart, then two, three etc. Nice spins too and great side legs, definitely time to start fading the object! Getting there with ball rolling! Nice sends to cik&cap, but try the multi-wraps too! Looking forward to see more of Vini! Foundations would be a good class for her too! thank you all for your sympathy!! Silvia, I do not have 24/7 access to an agility course/obstacles any more. I only have 6 cleanrun jumps and a DW (placed in my friends garden). What will be needed for the Foundation class? Mostly just 3 jumps and 1 tunnel… If you wanted to work on weaves too, you would need stick in the ground poles too -- but you could make those yourself. We trained figure 8 forward today and “twist & turn” -- and yes, I admit, I did use luring for the figure 8 🙂 I taught this trick to my other dogs, too, and I found it very easy to use some lures and then help less and less and use only a little leg movement. 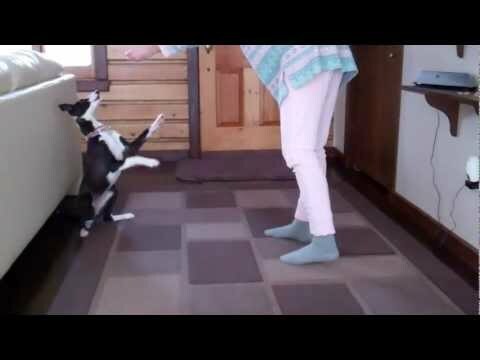 Limping is still a long way to go, we have just started this trick and I click paw lifting and duration at the moment… so still work in progress! Cool, great figure 8! No problem with a little lure, I noticed with dogs who understand shaping that using either a nose target or a lure is pretty much the same: my dogs don’t care if I have food in my hand or not, as they know they are getting some that way or another -- AFTER they do something of course. Nice spinning too, why don’t you just call it left&right -- it’s easier to use it then on agility course! So you call your spins “left” and “right”, and circling “cik & cap”? I’m not sure I understand the difference? I thought cik & cap was for tight turns (like circling) and left and rigth for just 90 degree turns. I haven’t started the spins yet. I’d like to know what would be the best cue? and could we not use that same cue for the full pivoting on an object? I’m a little confused about all the different turns/spins/pivots and what each cue should be. Yes. The difference is cik&cap is always going around the OBJECT. We are first doing circles to shape for tightness and bending of the back and then later on to teach them how to jump tight. Eventually, we’ll use it as a send to collection jump (not necessarily full wrap at all!). Cik&cap are send-to-collect cues. Left&right are directional cues we’ll eventually use for turning on flat, after tunnels or contacts and jumping in extension in one or another direction. So yes, the final behaviour looks quite different as a spin, but as spins allow me to train it without equipment, often and are great warming up exercise, I train it as a spin and then just use it on course. Of course, they ignore it at first, not knowing what I want in this situation (or, if they’re like Bu and always do exactly as told: they spin) -- but it’s just a question of a couple of trainings and it all clicks together. -- Dogs are smart 🙂 Much smarter as some people think. Well, pivoting at your side is different as walking forward in heel too… And I still name it the same. The concept of “stay at my leg” is the same. Multi-wraps have the same concept as the final behaviour: “stay close to that object/wing”, spinning left&right have the same concept as turning on agility field: “turn left/right”. Of course, those are variations to the original theme, but then, do you name “jump” differently at each height that you progressed through? It’s different to jump 10cm as 65cm, right? -- But I still name it “jump” at 10cm already! I actually even name “weave” when still working with a channel. -- And NEVER EVER had a weave problem with any of my dogs! Never had a confusion with multi-warps on course either and I still work on them as a warm up! I actually even do them on course when I am redoing the turn I didn’t like! And I still do them around the trees -- “staying close” is the important concept here and it’s the same from this beginning step on. Thanks Silvia. It makes sense when you explain it like that. :-). I can’t believe the class is ending! 🙁 I’d like to join the advanced tricks class but maybe not immediately -- we still have so many puppy class tricks to learn! Did I understand it right that the registration for the advanced tricks class is always open? If so, we’ll join a bit later. That’s a lot of snow for Papu’s legs! 🙂 Left side legs look ready to try it against the chair! Great job with sit up to stand up and back! -- Very funny he can do that so well after the sit up problems! Getting there with stacking bowls, time to work towards more precision. Nice front foot lifts, should be ready for some limping soon! For the ball rolling, you need to stand up now, so that you can allow more movement and reward from above, it’s easier for them to keep a balance on it then. And yes, Advanced Tricks are always open, so you can join any time you want! Thanks Silvia! As you said Papu really got that sit up at some point! 🙂 But I think I will pass the sit up+down excercise as I think it is too hard for him to get all the way up from down… His bowl stacking technique is really not very good. We’ve also practiced putting a ball to a cup and he keeps throwing the ball up to the air until it lands to the cup by chance… Not sure how to get him to be more precise. Maybe he’ll learn with more practice. I am also having trouble getting any precision with stacking bowls. Tat likes to throw them all over the place. Trumpet seems to think he needs to bring the bowl to me (I guess from his dumbbell work). They’re just not getting it that it’s the other bowl they should be aiming for. I even tried holding the other bowl which worked okay, but it doesn’t transfer when I put the bowl away from me. We really struggled with flinging things about or putting things in my lap instead of putting “this into that.” What finally really worked for me was to use a tall, deep container. We were staying at a hotel and the ice bucket was a fancy metal urn. I sat in a chair (so he couldn’t put things in my lap) and held it between my feet at a bit of an angle, so it was right at the same level as his mouth. Then I’d throw the ball and when he came running back with it to drop it at my feet, it practically fell in the urn on its own. Then I set it flat on the ground between my feet, then gradually moved it out away from my feet until it was several feet away. Then when we got home, I used a kitchen utensil crock, like you use to hold your spatulas next to the stove. Then, obviously, smaller and smaller. Before the urn, I was always having a problem with him not looking down to see what he was doing. Also he wanted to put a foot in every time, and he couldn’t do that with this tall urn. But I gradually used shorter and shorter containers and now he’s down to putting a little cork in a Japanese teacup. And once he understood the concept of “put this in that,” then the bowls came really easily, too. Now I think the bowls are his favorite trick, he barks and barks and then I deal them out like cards. So cute! Oh, really… -- it looked very promising! And you tried putting the other bowl down VERY slowly? And then VERY slowly away? I may have tried progressing too quickly although I think Tat also learned that flinging the bowl around was rewarding in itself, lol. The other day at work I saw her zooming by with a METAL bowl in her mouth. 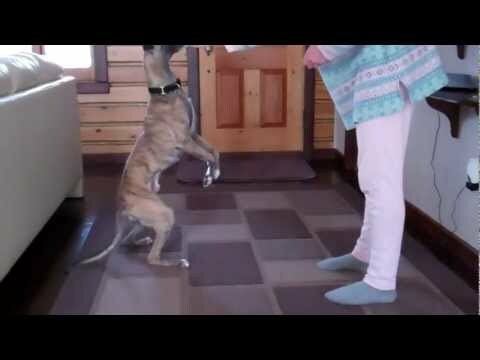 Whippets don’t like metal…. But as Diane stated they don’t even look to see where the other bowl is, and I get some paws too with my other dogs so I will try Diane’s suggestion of using an ice bucket at first and then gradually go smaller. I think that might just work. Maybe he will surprise you with down to sit up… Maybe just try -- it’s normally much easier as going from stand up to sit up and is good for back muscles. But yes, if you see he is having a hard time, then just skip it. To get rid of throwing and get more precision, you could maybe try what Louise did, holding the other bowl in the hand and having him put it in: with a bowl that high, he won’t be able to throw -- and then you can slowly lower it back to the ground. Diane suggestion is very good too! Not easy to master all the tricks in 3 months no… -- it’s not even expected, I just list so many to keep you busy after the end of the class too 🙂 But he definitely mastered enough for a GREAT graduation video! Here are our last videos :-(. The Sit-up to Stand back to Sit-up is a hard one. This is where we’re at. I did try to get Trumpet to come up just a bit but he’d either not move at all, or stand up completely. If I tried to get him to use my arm for support he’d step away, he didn’t like that at all. Still, we’re trying and I think I see a bit of progress. I feel as though I am luring too much though. Wow, Tat is great, she makes it look real easy! 🙂 Almost there with Trumpet too! A lure is o.k. for this trick, it’s very easy to fade it into a hand signal. Great job! Okay, here’s how we’re standing on a final day of the class 🙂 As you’ll see we’re still far behind. The two things from the video that I would especially need advice are “hug the pole” and “2 on 2 off”. For “hug the pole”, am I clicking the right thing? For “2 on 2 off”, as you can see I can’t seem to get any duration in the position? Getting there with a sit up, slowly add duration. Great back, slowly add distance. Left&right, you can try more spins in a row in the same direction (for one reward). 4in, I would really focus on duration now (rewarding in a box!) to get real standing in as at this moment, she doesn’t know it’s about standing in and with smaller boxes, it will only get more difficult. It’s similar problem with 2on2off, looks like you skipped the step of rewarding in a position. Kneel down close enough to an object that you can rapidly toss treats between her front legs. NEVER reward away from the position before saying “go”. For now, reward 20 times in a position for one “go” and then slowly reduce frequency of rewarding in a position -- eventually to zero, but not there just yet. Getting there with cik&cap, but also often late with the delivery of the reward. For hugging, you can get more strict with the criteria and not click pawing anymore, but only when a paw goes to the side some. first side legs up, I´m using 2 chairs but he can´t put his legs on it, then a bowl into another now I´m only clicking when he puts the bowl into the other bowl and finally he is trying to roll the ball.